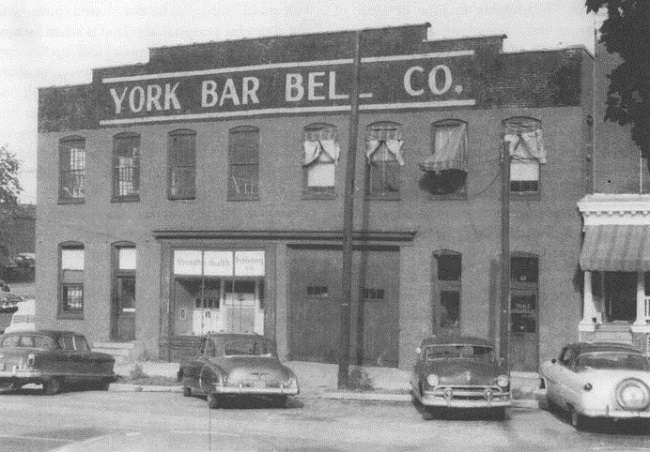 The original York Barbell Company headquarters, located at 51 North Broad Street in York, Pennsylvania, from 1932 to 1958. In the 1920s Bob Hoffman began selling oil burners in York, Pennsylvania, but his true passion was physical fitness. He initially cofounded a local gym, the York Oil Burner Athletic Club, but by 1932 he left the oil burner business entirely and established the York Barbell Company. Many of his employees followed him into bodybuilding and weightlifting, and Hoffman fielded the American team for the 1932 Olympics. He continued to coach Olympic competitors and sponsor international competitions for nearly four decades. Although Hoffman’s bodybuilding techniques, business practices, and personal life faced criticism over the years, he is still widely acknowledged as “The Father of American Weightlifting.” He was famously generous to his athletes, hiring many of them as employees in his company (with weekly salaries up to $200 during the postwar years), paying for their travel expenses and housing, and financing their local businesses in the surrounding community. And he was, and still is, renowned for opening the sport to all participants, regardless of race or nationality. Professor Fair notes elsewhere that Hoffman’s tutelage was not limited to men. “Although Hoffman was by no means the first to advocate weightlifting for women, he did more than anyone to gain acceptance for the principle of heavy training for female athletes.” A number of women were a significant part of the York Barbell family, including his wife and (when the marriage fell apart) several of his girlfriends. One of them, Dorcas Lehman, was a local saloon owner, and she renovated and managed a hotel where Hoffman hosted athletes visiting York for competitive events. She was already billed as “the strongest woman in the world” when Red Smith met the couple in New York in 1947 and wrote the amusing and supportive column we’ve selected for our latest Story of the Week. Hoffman’s dominant influence in the sport continued through the late 1960s, and he died in 1985 at the age of 86. Lehman dropped out of the York bodybuilding scene and vanished from the public eye during the last half of the century. We recently learned that she died only two years ago in Burbank, California; she would have turned 100 this year. She is buried in Forest Lawn Memorial Park in Hollywood Hills. For a few hours yesterday New York wore, like an orchid in her hair, a flower of femininity named Miss Dorcas Lehman, who is the strongest lady in the world. . . . If you don't see the full selection below, click here (PDF) or click here (Google Docs) to read it—free!